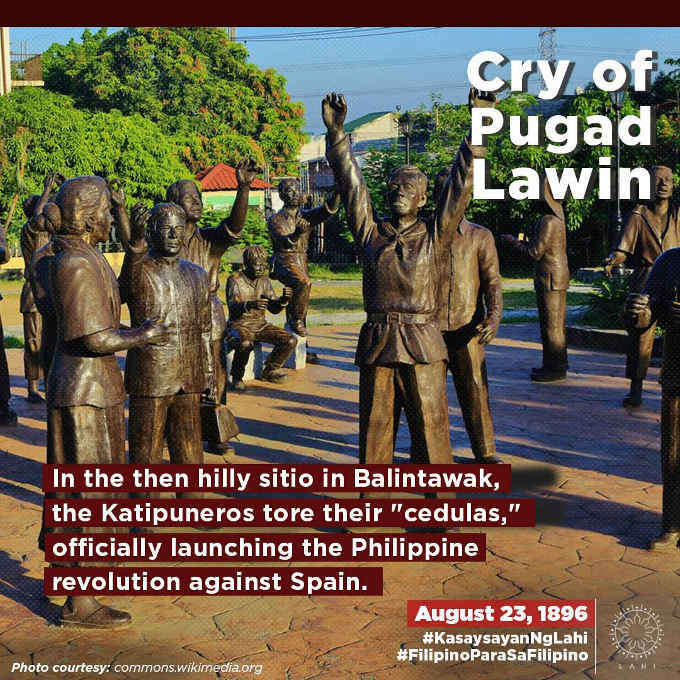 The Cry of Pugad Lawin, August 23, 1896, In the then hilly sitio in Balintawak, the katipuneros tore their “cedulas,” officially launching the Philippine revolution against Spain. On August 23, 1896, in a then hilly and forested sitio of Pugad Lawin in Balintawak, now part of Quezon City, the Katipuneros led by Andres Bonifacio tore their “cedulas” as an expression of their open defiance against the Spanish rule in the country. This event, called the “Cry of Pugad Lawin”, officially marked the beginning of the Philippine Revolution against Spain. Founded by Bonifacio, Ladislaw Diwa, Deodato Arellano and others on July 7, 1892, the Katipunan was initially a secret society aiming for independence from Spain through armed revolt. Bonifacio was forced to bring the fight to the field upon the discovery of the secret organization. He issued a manifesto inciting people to take up arms against Spanish tyranny simultaneously in all towns. The revolt eventually grew in strength and spread to eight provinces –Manila, Bulacan, Cavite, Pampanga, Tarlac, Laguna, Batangas, and Nueva Ecija — which were later represented by the eight rays of the sun in the present Filipino flag. After the death of Bonifacio on May 10, 1897 in Maragondom, Cavite, General Emilio Aguinaldo continued the revolution and declared Philippine independence from Spain on June 12, 1898 at Kawit, Cavite.